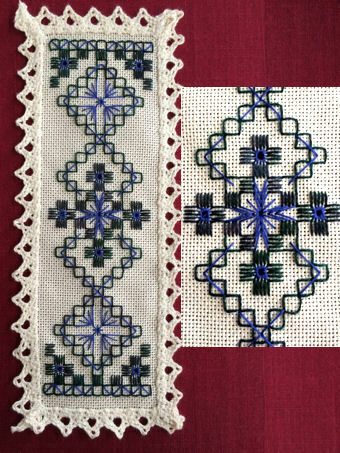 The design is by Roz Watnemo, sold through Nordic Needle as Basic Hardanger kit, Bookmark #1. Stitches taught in this kit: Satin stitch (kloster) block, box stitch both straight and diagonal, and four eyelet variations. At first I followed her written pattern for the box stitch, but I got lost and went to looking at the photo and following her design that way. 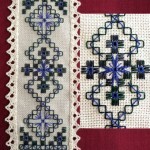 Little photo on the right of each bookmark is to show you the interesting center pattern she included in this design. Clicking on the photos will show you a larger view. The top bookmark shown is worked in the threads provided within the kit: The kit included the lovely, delicate colored Summer Mist thread which is a Sullivans size #5 overdyed pearl cotton. The kit also included ivory size #8, but I switched that out to my Anchor light rose pink 968 size #8 as I wanted the eyelets and the center one I showed you in the left photo a pink color not ivory (which would had blended into the ivory color of the fabric). The bottom bookmark is worked from threads within my stash: Caron Wildflower cotton Blackwatch (140) and DMC Coton a Broder Royal Blue (797). I choose the bright Royal Blue because it pops very nicely against the variagated dark green of the Caron thread. This was my first time using DMC Coton a Broder and I quite like the feel and color of the thread. 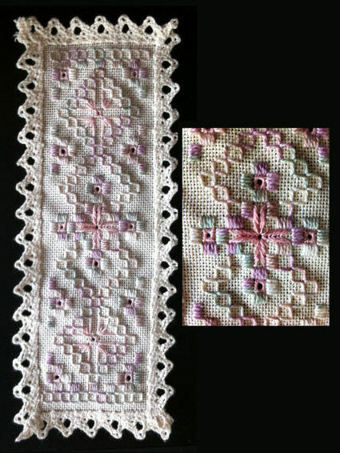 Each kit includes a lacy edged 20 count Lugana fabric for the bookmark, sizes #5 and #8 thread, size 22 and 24 tapestry needles, a needle threader, a color photo of the finished bookmark, chart, complete instructions and illustrations for each stitch. The full kit and the lacy edged 20 count Lugana fabric for the second bookmark was purchased from Nordic Needle website. 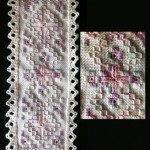 The lace edged fabric is approximately 8.5 inches by 3.5 inches in size.